Recently, I was teaching on the “Curses” of Genesis (immediately after the two humans in the garden ate the fruit–I don’t call it the Fall, because that’s not what the text calls it). I got an email from Debbie who asked about what the woman’s desire for her husband meant in Gen. 3:16. When asked about it in class, I responded that I thought the woman’s desire was for relational and sexual intimacy. In her email, Debbie said had been always been taught that the woman’s desire was to rule her husband, but he was supposed to rule her as the curse explains. To the woman he said, “I will surely multiply your pain in childbearing; in pain you shall bring forth children. Your desire shall be for your husband, and he shall rule over you.” (Gen. 3:16 ESV). I think it’s possible that her desire might involve rule since God goes on to say “he will rule over you.” I’ve heard that perspective also, I’m just not convinced by it since I don’t think it takes the text seriously. The text doesn’t say “your desire will be to rule over your husband”, it just says “your desire will be for your husband.” So to come to that conclusion you have to add a bunch of words to the text, which I don’t feel comfortable doing. The problem is the Hebrew word translated as “desire” only appears a three times in the OT, so it’s difficult to be conclusive. In Gen. 4:17, God tells Cain that sin’s “desire is for you, but you must master” it, which could be used to argue that “desire” is an attempt to rule. But the parallel isn’t great since we’re talking about the relationship of sin to a person in Gen. 4, versus the relationship of a person to another person in Gen. 3. So, making the first woman parallel to sin in 4:17 is problematic on several levels. Against the view that her desire was to rule him are two things. First, the same word is also used in Song of Songs (or Song of Solomon): 7:11: “I am my beloved’s and his desire is for me.”—which is clearly in the context of romance and sexual desire, not rule/authority. While Gen. 4:17 is closer in context to Gen. 3:16, I think the Song of Songs parallel is more similar since it speaks of a relationship between a man and woman which is exactly what Gen. 3:16 is talking about. In Genesis, it’s a woman for a man, in Song of Songs, it’s a man for a woman. Second, the text says that the object of the desire is her husband full stop, not his position or his authority. So, to interpret it as a desire to rule over him means you have to change the meaning of the words. So, instead of adding words to make it seem like she was trying to rule him, I see more reasons to conclude that she’ll desire intimacy with him, despite the fact that birth is painful and that he will try to rule over her. The only other thing to add is that Genesis 3 shows us how male rule came only as a result of sin, that’s not how God set it up in Genesis 2. I just finished your book “God Behaving Badly”. I am not yet a Christian, but have been on a decade and a half progression from being in Dawkins/Hitchens mode to being presently a deist who is friendly and curious about the faith. I’ve even recently started attending a church and (gasp!) reading the Bible. A big obstacle (that I knew was coming) was the subject of your book. Thank you for helping me gain a better understanding of Yahweh. You’ve provided me with another nugget to chew on. Upon finishing the Pentateuch, another very unexpected obstacle has gotten in my way. You came tantalizingly close to addressing it: the fact that God is quite often a person, even at times a mundane regular dude. To me, this wreaks havoc on my understanding of the Trinity. I thought the coming of Jesus, the Word made flesh, was a singular event in history that occurred for a singular purpose. I have been intrigued by this for years because this seemingly whacked, logically absurd idea of a God-Man also has parallels in scientific discoveries (the dual nature of light, for example). To see God popping up willy nilly all over the place in human form in my mind displaces this significance and undermines Jesus’ role and uniqueness in the Trinity. In my line of thinking now, Jesus’ coming was far less special since Yahweh (or was that Jesus?) was doing it all over the place in the OT. The disciples understood the jaw-dropping nature of Jesus as God post-resurrection, but in the OT most people who encountered him as a person didn’t think much of it. I realize this is not a single, coherent question so here goes: Is there a resource you can direct me to for a way to reconcile my misunderstanding of the Trinity with the OT accounts? 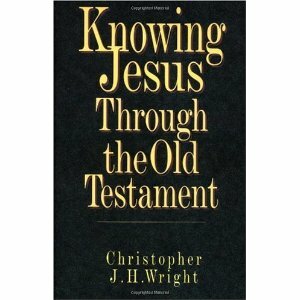 I replied, affirming him for his honesty and his question, made a few other comments, then recommended Christopher Wright’s, Knowing Jesus through the Old Testament (http://www.amazon.com/Knowing-Jesus-Through-Old-Testament/dp/0830816933/ref=sr_1_1?s=books&ie=UTF8&qid=1315338985&sr=1-1). I asked for his permission to post this, hoping that others might have helpful recommendations. What books would you recommend for Jon?